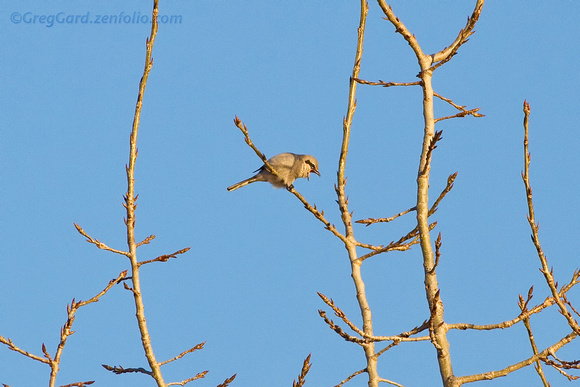 As of today, February 23rd, one of the latest favorites amongst birders in New Jersey, Northern Shrike, still hangs around Richard W. DeKorte Park in Lyndhurst. My “hunt” for this rare bird ended with success at the end of last month. After two unsuccessful attempts, I finally got lucky. I had a pleasure not only to listen and see this “masked predator” but I’ve got also a chance to take a lot of pictures and record a short video! This video was possible thanks to a friendly birder, Chris T., who on the end of that day spotted this bird hidden between branches. 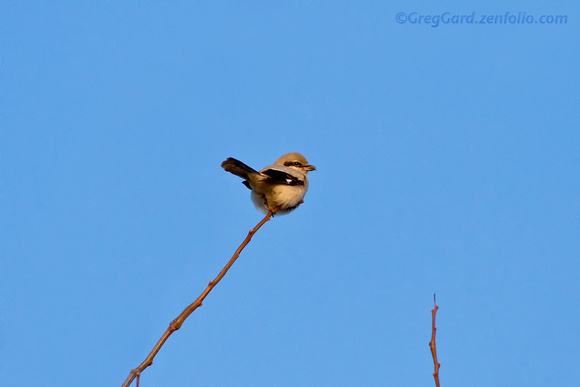 To our surprise Northern Shrike came back to the spot where he previously impaled his victim and started his dinner! Norther Shrike ©Greg Gard - greggard.zenfolio.com - Canon EOS 7D, 400mm F5.6, ISO 400, 1/1000s, f/7.1 AV mode, exposure compensation +1. Handheld. Cropped Frame. Video recorded on Canon EOS 7D, 400mm F5.6 lens. ISO800. Camera was mounted on the the tripod. Cropped frame. Sound deleted in post-processing (to much background noise).